Wits women’s A-team hockey have moved one position up in the Women’s Winter League. 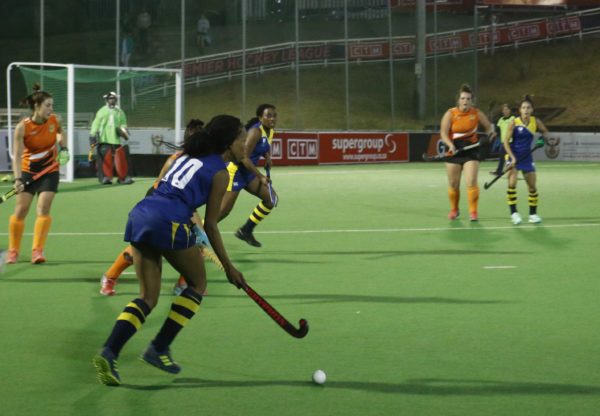 The Wits women’s hockey A-team has broken into the top three of the Women’s Winter hockey league after beating the University of Johannesburg (UJ) women’s A-team, for the first time, at the Randburg Astro on Tuesday, August 21. Pietie Coetzee-Turner, the women’s hockey head coach, told Wits Vuvuzela that her team had only ever drawn against UJ before. “When this hockey programme started we had to resort to all sorts of defensive tactics just to survive a game against UJ,” she said. The 2-1 victory did not come easy as both sides had a strong defence and attack structure. It was a slow start to the game with an even possession of the ball between the teams. The Wits keeper was able to save the first attempt at goal by UJ but the second attempt hit the back of the goal box with less than five minutes left in the first half to give UJ the lead. Wits kept their spirits alive as they continued to attack. Robyn Johnson, the Wits centre-forward, broke into the circle 15 seconds before the break and hit a back-stick just below the keeper to level the score, 1-1. Wits came back in the second half with more energy and Amber Dry scored in the first 30 seconds, putting Wits in the lead with a score of 2-1. Although both teams had many opportunities to change the figures on the scoreboard, no other goals were scored. Johnson, an honours student in media studies, told Wits Vuvuzela that the win was a good sign for Wits hockey. “I think we played really well as a team and we are so happy with this win and making history for Wits,” the centre-forward said. Ian Robertson, a regular spectator at Wits hockey games, felt that the Wits team, which includes his daughter Gillian, gave it their all. “I thought they played exceptionally well. It was one of their better games in terms of positioning and it was well structured with two magnificent goals,” he said. “UJ put up a really good performance as well. They are also structured and made it quite difficult for us. It wasn’t a walk in the park as it was a hard game for both sides,” Robertson added. Coetzee-Turner said that although she is generally quite happy with her team, there is always room for improvement. “We can improve on scoring goals, we can control our midfield a bit better and we can maybe be a bit fitter, but the girls are also fatigued because of all the competitions they’re in at the moment,” said the coach. The A-team’s next game is against Krugersdorp High Old Students Associations’ women’s A-team on Saturday, September 1 at Wits.